Playing 1-1 draw with NorthEast United FC at the Indira Gandhi Athletic Stadium in Guwahati, Bengaluru FC continued its unbeaten start to this season’s Indian Super League (ISL), on Wednesday. A match report published on Wednesday by India Today stated that the first half of the game between NEUFC and Bengaluru FC was very tight. But after the first half, Eelco Schattorie’s side took the lead through Federico Gallego (64th minute). But with efforts came in from Chencho Gyeltshen, a Bhutanese striker, earned a point for the Bengaluru FC. The report stated that the first chance fell for the home side when Lalthathanga Khawlring threaded a through ball for Redeem Tlang but the latter’s shot was just about kept out by an onrushing goalkeeper Gurpreet Singh Sandhu. From the ensuing corner, Bartholomew Ogbeche, who was under pressure from Xisco Hernandez, managed to head it straight at the Bengaluru custodian. The report also stated that it was a scrappy game with both teams struggling to dominate the midfield. While Pawan Kumar in goal looked shaky each time the ball was played to his feet, the Bengaluru FC survived a couple of close offside calls against Ogbeche. The report further stated that Carles Cuadrat changed the way his side lined-up after the break with Harmanjot Khabra moving to the right-back position with Rahul Bheke on the opposite flank. 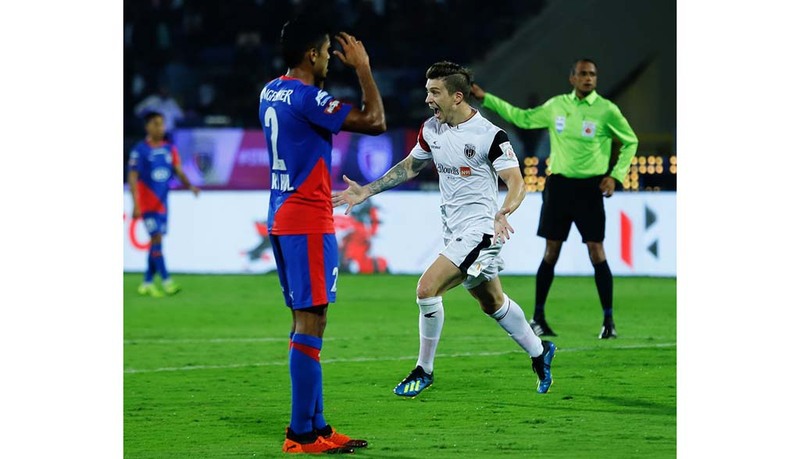 But it was NEUFC who had a chance when Ogbeche and Rowllin Borges combined with the former sending a cross into the box which was cleared by Eric Paartalu straight into the hands of the Bengaluru custodian. In the 64th minute the breakthrough came as Federico Gallego found a way past the Bengaluru defence. Bengaluru FC came close in the 88th minute when Khabra’s cross was chested down by Xisco for Chencho and the Bhutanese striker’s shot sailed over; however, Chencho wasn’t going to be denied for the second time as his kick after getting on the end of a Chhetri header helped his side find the equaliser. Though the match was dubbed as NEUFC’s toughest test of this ISL season, at the end then game ended in a dull draw.